Our sacha inchi seeds are grown and sustainably harvested in the Amazon Rainforest of Peru. 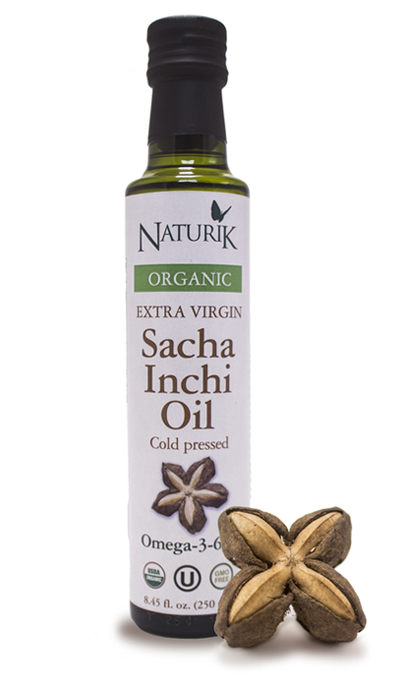 Our sacha inchi oil is obtained by cold pressing the seeds. • Contains up to 48% omega-3 ALA.
• It has an ideal balance between omega-3 and omega-6 (1.3 to 1). • Uniquely balanced composition of fatty acids. Up to 92 % are omega-3, omega-6 and omega-9 fatty acids. • High in antioxidants such as vitamin E, which is why it is highly resistant to oxidation. Due to its mild nutty taste, it can be consumed directly 1 or 2 tablespoons a day or use in salad dressings, vegetables, pastas, yogurts or smoothies. Also, it can be used as a cooking oil and add Omega-3 fatty acids to homemade dishes as it is suitable for all types of cooking methods, including baking, roasting and stir-frying. Organic Sacha Inchi Seed Oil.